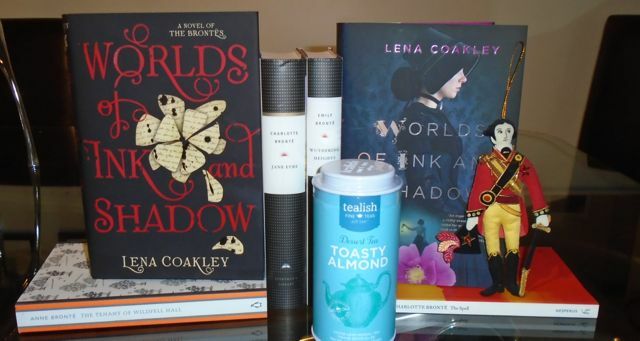 Two Chicks On Books: Blog Tour- WORLDS OF INK AND SHADOW by Lena Coakley An Interview and A Giveaway! Blog Tour- WORLDS OF INK AND SHADOW by Lena Coakley An Interview and A Giveaway! I am so excited to be hosting a spot on Lena Coakley's WORLDS OF INK AND SHADOW blog tour! I love the idea of this story with the Brinte siblings and also today is it's release day so happy book birthday Lena! I have an interview with Lena to share with you today! And make sure to check out the awesome giveaway below! Haven't heard of WORLDS OF INK AND SHADOW? Check it out! Charlotte, Branwell, Emily, and Anne. The Brontë siblings have always been inseparable. After all, nothing can bond four siblings quite like life in an isolated parsonage out on the moors. Their vivid imaginations lend them escape from their strict upbringing, actually transporting them into their created worlds: the glittering Verdopolis and the romantic and melancholy Gondal. But at what price? As Branwell begins to slip into madness and the sisters feel their real lives slipping away, they must weigh the cost of their powerful imaginations, even as their characters—the brooding Rogue and dashing Duke of Zamorna—refuse to let them go. Gorgeously written and based on the Brontës’ juvenilia, Worlds of Ink & Shadow brings to life one of history’s most celebrated literary families. Hi Lena! First I want to say welcome to Two Chicks on Books! I can’t wait for WORLDS OF INK AND SHADOW and I know my readers can’t wait as well and am so happy that you could stop by for a visit! Thank you so much and I’m so happy you could be a host on the blog tour! For the readers: can you tell us a little bit about WORLDS OF INK AND SHADOW and the characters? 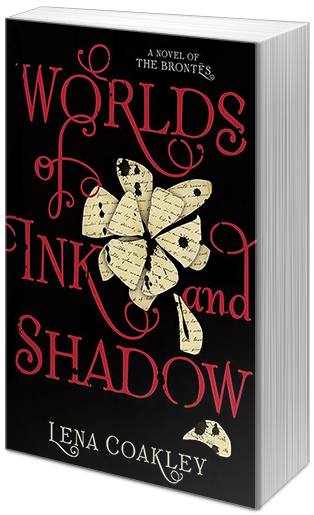 WORLDS OF INK AND SHADOW is about Charlotte, Branwell, Emily, and Anne Brontë and the fantasy worlds they wrote about in their childhood and early adulthood. Yes, the three girls are the same sisters who wrote JANE EYRE (Charlotte), WUTHERING HEIGHTS (Emily), and THE TENANT OF WILDFELL HALL (Anne), so I’m using real historical figures in my novel. I’ve fictionalized them quite a bit, of course, but I’ve tried to stay true to who they were. The siblings were mostly schooled at home after Charlotte and Emily had a disastrous experience at a school where their two older sisters contracted tuberculosis and later died. The four remaining siblings became very close. They wrote numerous stories about fantasy worlds full of melodrama, intrigue and scandal—something that would have surely shocked their parson father if he had known about it. The premise of my book is that these fantasy worlds were real places that the Brontës could escape to—but for a price. When they get older and try to leave their childhood worlds behind, the characters they created turn out to be more real than they had imagined. How did you come up with the idea for the book? I love the Bronte Sisters books and I think this is such a cool way to pay tribute to them! As soon as I learned that the Brontës had fantasy worlds that they wrote about in childhood, the idea to make them real came to me in a flash. I had to write it! Of course, I didn’t start the book right away—I was working on WITCHLANDERS at the time—but the idea stayed at the back of my mind, percolating. Who was your favorite character to write? I love Emily. On the one hand, she was the hardest to get to know through research because, unlike Charlotte and Branwell, she threw away most of her childhood writings and didn’t correspond much by letter. In the end, though, this gave me more freedom to create the Emily I wanted her to be—a free spirit, someone who leaps before thinking, sometimes shy, sometimes brave to the point of recklessness. In fact, I liked the character so much that she was the main character in an early draft of the novel. However, my US editor thought that Charlotte changed and developed more throughout the story, and we decided to try bringing her to the forefront—the right choice, as it turned out. I feel like I also want to say something about Branwell. He was the Brontë who didn’t become famous, and who grew to be something of an embarrassment to the family. He died at 31 of tuberculosis brought on by his alcoholism and drug addiction. I read so many of his childhood writings that I feel like I know him, and I loved bringing him to life on the page. I’m very proud of some of his scenes. In my opinion, the stories he wrote at 17 were as good as Charlotte’s at 17, and there’s something very tragic about that—a potential unfulfilled. What is your favorite passage/scene in WORLDS OF INK AND SHADOW? I love the end of the first act when the four Brontës are at a grand party in the fantasy city of Verdopolis and everything starts to go wrong. All four characters get point-of-view scenes. Lots of things are happening at the same time but in different parts of the mansion. It was like choreographing a ballet—very difficult but very satisfying when it finally came together. Lots! The book took four years to write and much of that time was devoted to research. There are so many Brontë fans out there that I felt a lot of pressure to get the details right. I studied the novels of the Brontë sisters at a continuing education course at Oxford; I went to Haworth, where the Brontës lived, and walked on the moors; I studied in the Brontë Parsonage Museum archives; but mostly I just read. I read their novels, I read their existing juvenilia, I read their letters, I read biographies, and I read literary criticism. I read and read and read! In the end, though, I had to put a lot of that aside to write my book. In spite of all that reading, I still had to make the Brontës up. They had to become my characters, imagined by me. I’ve recently discovered a new favorite author and I’m really excited about her! I read CUCKOO SONG by Frances Hardinge this year and went absolutely wild for it. It’s a changeling story that’s borderline between YA and middle grade. It won this year’s British Fantasy Award. Now I’m going through everything else she’s written. A FACE LIKE GLASS (middle grade) is one the weirdest, most inventive stories I’ve ever read. Right now I’m reading VERDIGRIS DEEP, a wishing well story. Still and always Aragorn from LORD OF THE RINGS. Books were so important to me when I was sixteen—life savers. I think I am always trying to write the book I needed when I was that age. A MONSTER CALLS, which they’d better not screw up! Thanks so much Lena for answering my questions! Lena Coakley was born in Milford, Connecticut and grew up on Long Island. In High School, Creative Writing was the only course she ever failed (nothing was ever good enough to hand in! 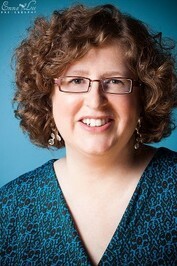 ), but, undeterred, she went on to study writing at Sarah Lawrence College. She lives in Toronto, Canada. Witchlanders is her debut novel. 5 winners: A black Brontë bonnet! Head on over to Chapter by Chapter for the complete tour schedule! What a fun post and giveaway! Thanks for the great chance! Looks like a great book. Four years of research is impressive. Thanks for the giveaway! The characters seem to really come to life. Four years of research turned into a great book. Thank you! I love new twists on older characters and plots and this sounds really good and like the author did her homework (and I loved that she "failed" creative writing and why). So glad you posted about this book Jaime!!! I remember when the cover came out and I was really excited about it but I hadn't seen anything else about it till this post!!! I will have to add it to my TBR!!!! Def want to read this! A friend of mine has been gushing about it! As soon as I saw one of these covers I was hooked. I'm definitely going to want to get my hands on both covers though. They look and sound fabulous! This sounds like a world to dive into with relish. I've really been looking forward to this one and that cover is phenom! #T4T- SERPENTINE & NAMELESS and A Giveaway!